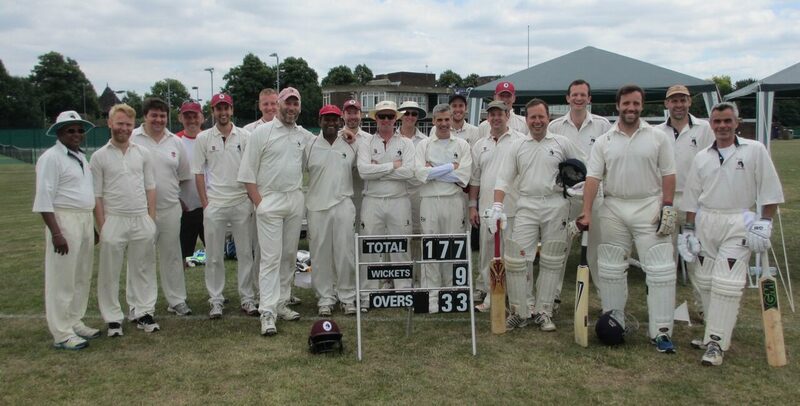 For their last match of the season, the Whalers travelled once again to the leafy suburbs of Dulwich. It was a superb cricket day – the sun was shining, the ground was beautiful (if a little hard to find), the wicket fast and bouncy, there was a record crowd (thanks for coming, Claire), and the local air ambulance was on stand-by to deal with the latest Whalers freak finger injury. We even won the toss, although this was a slightly hollow victory as the opposition would sportingly have put us in anyway, as Dan Hall and Chris Sherratt were yet to arrive. And the opposition’s generosity extended to their opening bowlers, with Al Dickenson (promoted to open the batting in circumstances which Sir Paul Condon will be investigating) and Dom Child giving the Whalers the perfect start. 50, a score normally encountered in the depths of a mid-innings crisis, was passed without loss in the 5th over, as Child in particular (perhaps empowered by wearing his boss’s clothes) took command, before retiring undefeated on 53*. This brought Ollie Bayne to the wicket, and although his normally balletic footwork was hindered by a leg injury, he battled through the pain barrier (showing Steve Waugh up for the Australian softie he is) to a gritty 24. However, there are few constants about playing for the Whalers (Richie Williams winning fine of the day, Andy Nelson’s shades, and a slow-drinking fine for Osbourn are some of them). But you can always rely on the middle order to collapse. Once Dickenson’s Boycott-esque knock of 33 was over, wickets began to clatter. To the disappointment of the serried ranks of photographers, Andy Nelson’s innings was brief – the following day’s newspapers had to be content with “action shots” from the extensive nets session following his dismissal [errrr, preparing for next season?]. Joe Nelson and Dave Humphreys followed, also victims to Child’s trigger finger, and the Whalers were wobbling. Fortunately, a well-timed drinks break allowed Child to be substituted as umpire, and Osgood (20*) and Batley (cruelly robbed of a debut half-century on 47*) saw the Whalers through to a mighty 225-6 declared from a mere 31 overs. In contrast, ECA were always struggling against the Whalers’ fearsome 4-pronged seam attack. Osgood achieved figures of 11 overs, 2 wickets for 9 runs by the simple method of consistently bowling a foot outside off-stump, while the first wicket to fall went to Sherratt. Finding the outside edge, the ball flew straight to the slip cordon, only to be intercepted by a diving Dave Humphreys who practically wrestled the ball out of Andy Nelson’s hands. In fact, the fielding overall was extremely sharp, only faulted by one dropped catch [sorry big guy, it had to get a mention] and a comedy stumping attempt. Paul Mildon (4 for 12) and Dickenson (3 for 16) then ran through the ECA order, with the skipper taking 2 wickets in consecutive balls with his infamous “mid-on trap”. Sadly for him, his “deep mid-wicket off a juicy full toss” trap wasn’t working as well, yielding only a succession of boundaries and an appalling piece of football mis-fielding from Chris Sherratt. But with the rain getting heavier, ECA were finally bowled out for 63 – a convincing Whalers victory of 162 runs – and the evening finished with many beers and a curry in Clapham. Or so I’m told.